With these attempts I am completing this trial of Kashmiri couching. As suggested by another member of TAST , I’ll have to approach this stitch in other ways too. Initially, this couching should be done on drawn pattern and not lines, this will help to practice this stitch, later , after mastering the technique, it will be easier. I want to continue this learning process, but will do so at a later date. 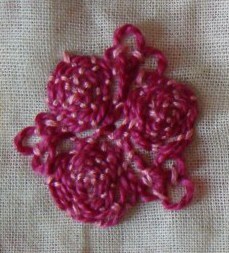 12-in this motif, three circles are worked in couching stitch with three twists added in between. 13-I tried the same twisted couching in this shape. 14-small paisley worked in circular couching in the centre and single twist couching around it. Though I haven’t done as much as required for this Kashmiri couching, starting this gave me some satisfaction. I can continue, where this was left, at a later date. Thanks Diane, for your wonderful suggestion, it has helped in reducing my anxiety . Today also I tried working on this Kashmiri couching stitch. The art of twisting the thread still keeps eluding me. Just have to keep working on it. 8- I tried alternating three twists with single twist of the thread in this row. 9- top row worked in single twist couching and the bottom is worked with two twists. Need lots of practice. 10- the centre was worked in large spiral couching, around it some small spirals. 11- after working a spiral couching in the centre, couching with a single twist was worked around the centre. They are worked in a line to form a border. 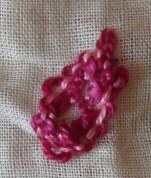 After the trials of the couching stitch yesterday, an idea of working this stitch as spirals came to mind. This is not my original idea. 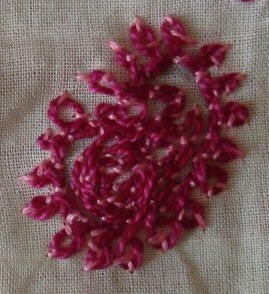 This couching stitch is used widely in Kashmiri embroidery. A thick skein of thread or wool is couched on to the fabric with a same colour thread. It is done in mono colour. Spirals form the basic pattern. 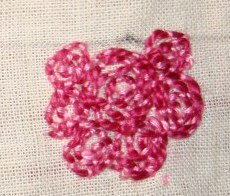 I had not tried this before, thought , for this week ‘s stitch, I’ll try to work this stitch. 2- A. I tried zig zag couching in this row. b. I started with the first row of spirals. Both these rows are worked on wool. 4-in this row continuous spirals were worked in a line. 5- a row of long spirals are worked in this row. 6-I tried alternating the previous two rows. Quite frustrated to see the effects, though!